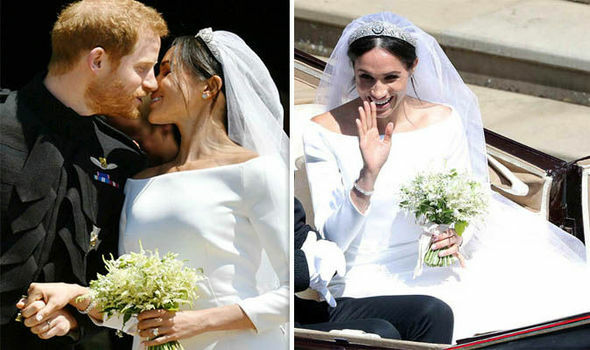 As the newspapers concentrate on Meghan’s dress, the first kiss and who was there, it’s also interesting (from a gardening point of view) to take a closer look at the flowers and the part they played in the wedding of Prince Harry and his American bride. The display at St George’s Chapel, both inside and out, was a natural and fresh combination of white, cream and green. On such a warm day, this immediately gave a cooling impression and, inside amid the congregation, would have provided some much-needed fresh air and natural fragrance. The gentle colours give a fresh, airy feel, are not distracting and make a wonderful frame in a photograph. The design was “cascading hedgerow” and much of the greenery used came from Windsor Great Park. In fact, the emphasis was on sustainability, so most of the flowers and foliage were sourced locally. This is very much the theme at the moment, with many brides this year opting for a natural bouquet of seasonal flowers, rather than using blooms flown thousands of miles. These larger displays featured white roses, both large-bloomed and spray, reputed to have been amongst Princess Diana’s favourite flowers, along with white delphiniums, ammi and peonies. Meghan Markle's bouquet was designed by Philippa Craddock in a “gentle, ethereal, relaxed” style and was bound with naturally-dyed ribbon. Sentimentality played a large part in this and Prince Harry himself picked forget-me-nots from Kensington Palace garden, another of his Mother’s favourite flowers. They were accompanied by lily-of-the-valley, fragrant sweet peas, Astilbe, jasmine and Astrantia. Also included, in line with royal tradition, was a sprig of myrtle taken from the plant at Osborne House on the Isle of Wight which was rooted from a piece in Queen Victoria’s wedding bouquet in 1845. Flowers are said to have meanings and white roses mean “I am worthy of you”, forget-me-nots also mean “true love”, lily-of-the-valley mean “return of happiness” and jasmine represents “friendship”. The flower theme was also well represented on the bride’s beautiful 16ft veil, which was embroidered with 55 different flowers. 53 of these represented the countries of the Commonwealth, plus Californian poppy for the area where Meghan was born and wintersweet, which grows in Kensington Palace garden.